Thinking a lot about an online friend today. So sad. Read her story by clicking the picture above. This woman lost custody of her daughter due to vicious lies told by her ex. She was threatened through e-mail yesterday around 3:00 p.m. She posted a comment about how if "anything happened to her in the next few days" we would know what happened. She was afraid of her ex. The courts had given her daughter to this man. She had little visitation and became very depressed. She was fighting and raising money to go to court. 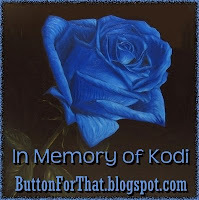 Last night about 5 hours after the threatening e-mail Kodi passed away. It is believed she took her own life, however I find the circumstances VERY suspicious. Read her story and show her family some support during this unbelievably hard time.